Venice at Christmas time is magical. The city is covered by shining lights and decorations, the atmosphere is so warm and sweet (thanks to all those biscuits, cakes and sweets you can buy pretty much everywhere) that your mood won’t be affected by the cold temperatures. Venice in winter is completely different compared to summer, mainly because of the weather, since in winter the city is embraced by mist almost every day, but it’s still so beautiful and unique that we are never fed up with it. There’s a lot of things to do at Christmas in Venice, let’s have a look at the most important and curious events for Christmas and New Year’s Eve that you can enjoy during your stay. Venice is a Christmas market kind of city, even if many people can’t imagine this is the case Usually, in Campo San Polo, not far from Rialto bridge, there are many stands where you can find some unique presents to bring back home as a Christmas souvenir from Venice, and you can always delight your palate with some yummy sweets. If you feel like taking the train or the bus you can reach Mestre, the closest city to Venice, and spend a day among its Christmas Markets and shows, especially if you’re traveling with children. Even if you’re traveling to Venice with no kids, there’s no reason why you shouldn’t spend an hour at the skating rink in Campo San Polo. It’s a way to remember how Christmas was when we were children, waiting for the snow to fall and turn everything white, wearing ice skates just to try them once and breathing that unique atmosphere that only Christmas can create. Another thing we love to do in Venice at Christmas time is going to the theatre, and if it’s snowing outside it’s even more romantic. The Goldoni theatre is not as beautiful as La Fenice, but it’s still a wonderful place to spend a couple of hours, immersed in music and culture. This year, for example, Swan Lake will be on stage on December 26, performed by the Moscow State Classical Ballet. Maybe going to the theatre is something you don’t usually do, but Christmas time in Venice is a good time to do it – not to mention that you’ll be attending the show inside the oldest theatre in the city. If you love concerts, you can’t miss those played by I Musici Veneziani, an orchestra formed by some of the best Venetian musicians and singers, which was established in 1996 to keep the memory of the Serenissima during its most splendid period alive. Every year, for New Year’s Eve, this group of artists organizes a concert at the Scuola Grande di San Teodoro, located halfway between Rialto and St. Mark’s Square, that it is really worth attending. You can read more about it and possibly buy tickets on the official website of I Musici Veneziani. 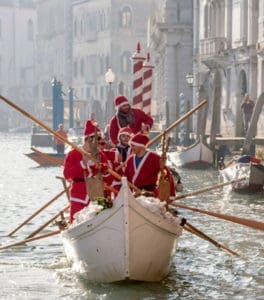 Imagine Venice full of Santas running all over the city! If you want to do something for charity at Christmas time and having fun doing it, there’s a run you can join in Venice, on December 16. With a symbolic 10 euro contribution, you’ll get a Santa Claus costume, and something to eat at the end of the run. It’s a way to experience Venice differently and meet other people who share the same desire of doing something nice for those who can’t live Christmas as we do. How could we fail to mention the greatest New Year’s Eve event in Venice? Every year a wonderful party takes place in the most beautiful ballroom in Europe: St. Mark’s Square. After a long live concert in the square, that you can attend for free, there’s a midnight firework display to welcome the new year. Don’t expect a firework show like the one taking place during the Redentore’s feast, which is absolutely the most beautiful one, but we can assure you that watching the New Year’s firework display coloring the night is something you’ll remember forever.